It is immediately obvious to anyone familiar with ancient Greek dialects contemporaneous with the 6th. century BCE Ionic and Attic, that Linear C had made huge strides over the much older Mycenaean Linear B syllabary. First off, the Linear C syllabary was from the outset in the 11th. century BCE, structurally much simpler than Linear B, having abandoned once and for all time all logograms and ideograms characteristic of both Minoan Linear A & Mycenaean Linear B. Linear C is simply a syllabary and nothing more. Grammatical Considerations: While we can be pretty much certain that the earliest Arcado-Cypriot documents in Linear C could not possibly have made use of the definite article, the typical later ancient Greek construction of a verb + ta (these things) in the neuter plural, the advanced dative singular with the definite article or the use of the definite article preceding names of gods and abstract words, all of these characteristics are firmly in place on this tablet, which was after all composed in the sixth century BCE, some 500 years after the first appearance of Linear C on the scene. (a) Whereas in Mycenaean Linear B it is not possible to clearly identify the gender of the nominative singular for nouns which are either masculine or neuter, such is not the case in Linear C. All nouns of any gender end in “se” in the nominative singular. (b) the use of the definite article twice in the same inscription. The definite article never appeared in early Greek writings, not even in the Iliad and the Odyssey of Homer. (c) Radically unlike texts on in Mycenaean Linear B, inscriptions in latter-day Linear C not only sported the definite article, but made frequent use of the typical Ionic-Attic verbal construction of a verb (in any tense) + the definite article in the neuter plural (ta) to denote abstract constructions, i.e. abstract thought. Abstractions are almost totally absent from Mycenaean Linear B tablets. (d) Finally, the dative singular, again used with the definite article for the names of gods & goddesses, city names and the like, was a huge leap forward from equivalent constructions in the dative singular on tablets in Mycenaean Linear C, where it is often difficult at best even to identify the dative singular, let alone distinguish it from the nominative singular. The same holds true for the nominative and dative plural, and indeed for all the cases. It is easy to isolate cases in Arcado-Cypriot Linear C, not only because the syllabary clearly demarcates them, but also because the definite article frequently appears in all cases. The same can scarcely be said of tablets or inscriptions in Mycenaean Linear B, in which the cases are all too often ambiguous, making it difficult to determine which is subject, which is direct and which is indirect object. Note that in the last instance of the dative singular on the silver spoon, I have translate the Greek for – the = + the feminine dative sing. of the number one as: for the one and only, because – miai – uncharacteristically follows the noun, i.e. the name of the muse, Clotho, adding extra emphasis to it. 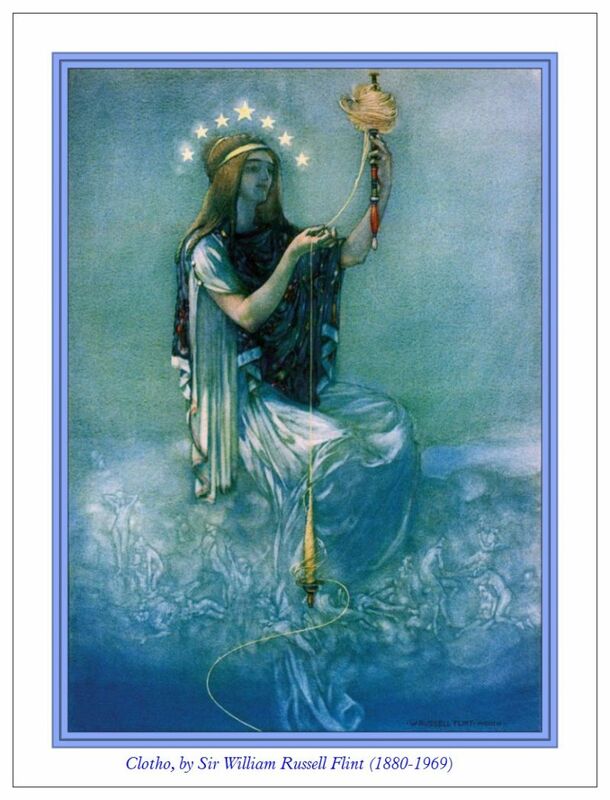 Although she is only one of the three Fates or Moiroi, she is in her own right the one and only of her kind. An earlier translation of this tablet which I found on the Internet tells us that the dedication is to the Golgian goddess, whoever that is supposed to be. Yet my own translation makes much more sense, given the century in which this inscription was composed, the 6th. cent. BCE, when the Three Fates or Moiroi were familiar fare to Greeks everywhere. The only case which is clearly demarcated in Linear B is the genitive, which appears as “oyo” in the masculine singular, “oya” in the feminine singular & “isi” in the plural. Otherwise, we are left to our own devices. The same cannot be said of inscriptions in Linear C, unless they are very early. There is only one such inscription that I know of, which I have already translated, dating from the eleventh century BCE. The Profound Implications of Cross-Correlation of Equivalent Vocabulary in Mycenaean Greek Arcado-Cypriot: All other extant inscriptions in Arcado-Cypriot Linear C date from the sixth to the fourth centuries BCE. Of these, the extremely long Idalion Tablet, an official decree, leaves little or no room for doubt with respect to the grammatical clarity or the vocabulary of documents written in the Arcado-Cypriot dialect. 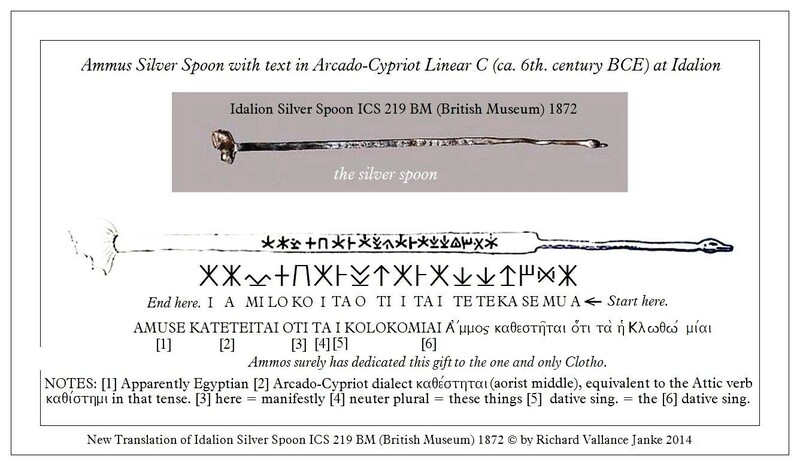 The vocabulary of such inscriptions cannot be in doubt in those instances where the inscription exists both in Linear C and in the Arcado-Cypriot alphabet, as is the case with the Idalion tablet. The vocabulary on that tablet cannot be interpreted as meaning anything other than what it says in the alphabetic version, leaving no room for alternative interpretations in the Linear C version. This fact alone has immense implications for tablets and inscriptions in Mycenaean Linear B, on which there appears any word which has an exact or nearly equivalent Linear C version. In such cases, the meaning of the Mycenaean word equivalent to its Arcado-Cypriot counterpart is relatively fixed, once and for all. Once put into practical application, this development will have a profound impact on the interpretation of many Mycenaean words which have (near) exact equivalents in Arcado-Cypriot, leaving little or no room for interpretations of their meanings, and effectively invalidating such interpretations where they clearly clash with their Arcado-Cypriot equivalents, either in Linear C or in the Arcado-Cypriot Greek alphabet. Recall that these two dialects are far more closely related than any other ancient Greek dialects, even the Ionic and Attic. Once you know and accept this fact, it becomes next to impossible to deny the evidence of Arcado-Cypriot words for which there are (exact) equivalents in Mycenaean Linear B. We intend to carry this hypothesis to its logical terminus, settling once and for all at least some of the disputes that have occurred over the “meanings” of a number of Mycenaean Greek words since the decipherment of the syllabary by the genius, Michael Ventris, in 1952-1953. Any word which says what it clearly says in Linear C or in the Arcado-Cypriot alphabet must almost certainly mean (almost) precisely the same thing in Mycenaean Greek. A rose is a rose is a rose.